Microsoft PowerPoint is much more than just a presentation tool. It provides a wide variety of options for giving information and helping people process it and memorize the most important points. 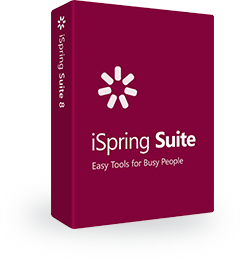 Did you know that iSpring Converter Pro provides the superior support of the most advanced PowerPoint features? Feel free to use all animations, transitions, hyperlinks and triggers in your presentations and iSpring will accurately convert them to Flash. Insert the “clue” pictures on your slide. Go to Insert→Pictures and choose your images. Insert the “answer” pictures onto your slide, then right-click them and select Send to Back so that they are hidden behind the “clue” pictures. Tip: You may also turn on Selection Pane to give distinct names to objects on a slide (Home > Select > Selection Pane). Create a Flip Custom Animation effect for each pair of pictures. This effect can be built with the Collapse Exit effect and the Stretch Entrance effect. Get a more detailed description on how to create these effects in the article Building a Flip Custom Animation Effect in PowerPoint. Select the “clue” picture as a trigger for all four pictures and all four animations (16 animations in total), as shown in the screenshot below. To preview your flash cards, go to Slide Show > From Current Slide. And that’s it! Each of your images is ready to click and flip to show the student the correct answer. Creating Flash cards is just one of the many ways to create wonderful learning materials by simply using trigger animations in Microsoft PowerPoint. We’ve made just one sample slide, but there is no limit to human imagination, and a great variety of features such as these can bring your ideas to life. If you have any ideas what kind of e-Learning topics you'd like to see discussed, feel free to leave a comment; we're always happy to write new content for you.